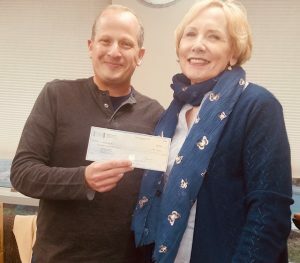 Paul Hasson of Shaare Torah Synagogue presents the check from the 2018 Labor Day Interfaith 5K Run/Walk to Margo Goldman, Executive Director of Gaithersburg HELP. Shaare Torah, Prince of Peace Lutheran Church, and the Islamic Society of Washington jointly sponsor this race. Registration for the 2019 Labor Day Interfaith 5K Run/Walk will open on May 1, 2019.